When archaeologists began digging the fields in 2010 they knew it was a site of historical interest, but even they were surprised by the wealth of ancient finds their trowels unveiled. Back in 1995, a hoard of 400 Roman coins was discovered west of Didcot in Oxfordshire, indicating the land had been lived on for centuries. As plans progressed for 3,300 new homes, schools and shops on the 180-hectare site, archaeologists were called in to investigate. 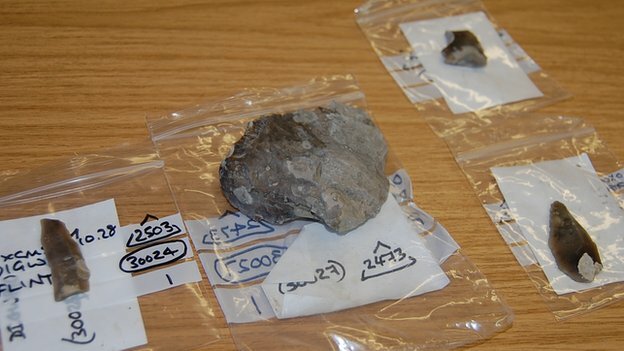 It has taken them nearly three years to excavate 30 hectares, but they now know people have been living in Didcot for about 9,000 years - since the end of the last ice age. As news has spread about the finds, local residents have begun a fight to save at least some of it. The fields, west of the town, have given a near complete timeline from when hunter-gatherers arrived in Oxfordshire in 7,000 BC, through to the present day villages surrounding the site. 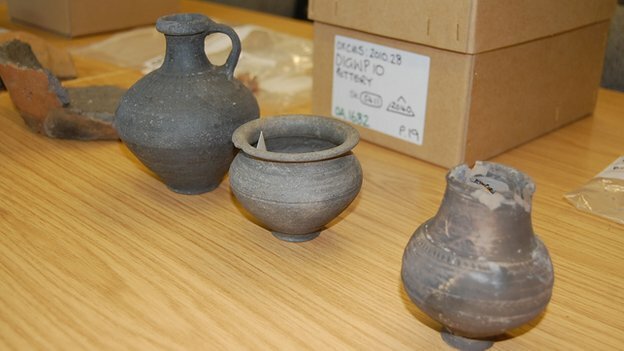 Those earliest remains were found by Steve Lawrence, from Oxford Archaeology, the firm which carried out the dig. He was walking around the site one day during the dig and spotted bits of flint on the ground. 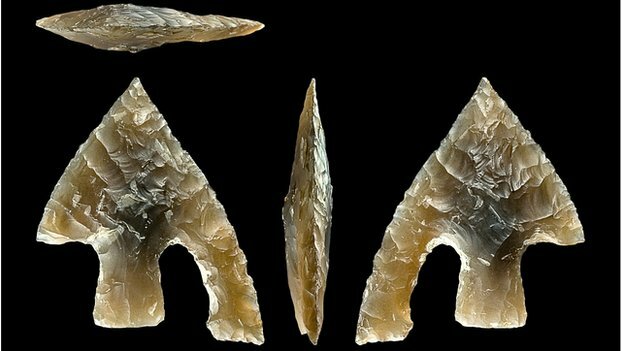 On closer inspection, the flint had clearly been worked and there were hundreds of pieces, dating back to around 7,000 BC. They would have been used on spears by hunter-gatherers who camped along the ridge to stalk their prey. 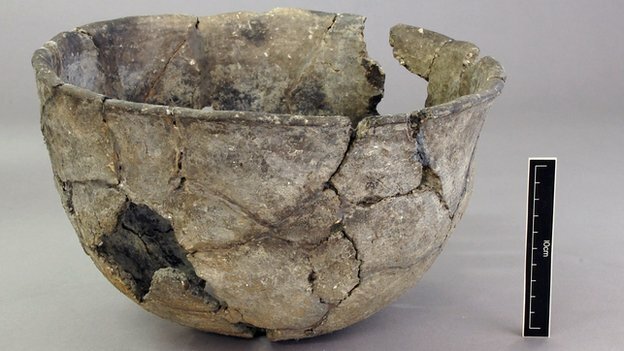 The most significant find of the dig was a rare Neolithic bowl from about 3,600 BC - when people began to settle down and farm the land. "It was found upside down in a hole where a tree had stood," explains archaeologist Rob Masefield, from RPS Planning and managing the project. "It may have been an offering to the gods of the underworld." Over time new the settlements were established across the site, which meant each part excavated unveiled a glimpse of a different era. Another rare find was a pond barrow - a stone lined 12m wide circular depression - which the archaeologists believe was used for "exposure burials". Mr Masefield said the body would be put up high on a raised platform and "the bones picked clean by birds and other animals". "Only ever a dozen or so pond barrows have ever been excavated so this provided some great new information," he added. Up to 50 burials, of both adults and children, were identified. Mr Masefield said: "It's possible that three or so of these burials in [grain storage] pits are what we call 'special burials', because it's not the usual way of doing it. "It could be ritual or they could be social outcasts." 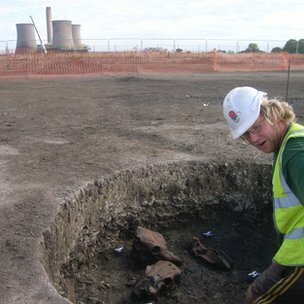 He said there is evidence found at other sites - though not at Didcot - suggesting Iron Age people did practise human sacrifice and may even have "bred" individual human beings solely for this purpose. "They are found with immaculate nails and signs of having lived a privileged life, almost like royalty," he said. "When the person is killed it's been done in three different ways. It appears to be ritual." 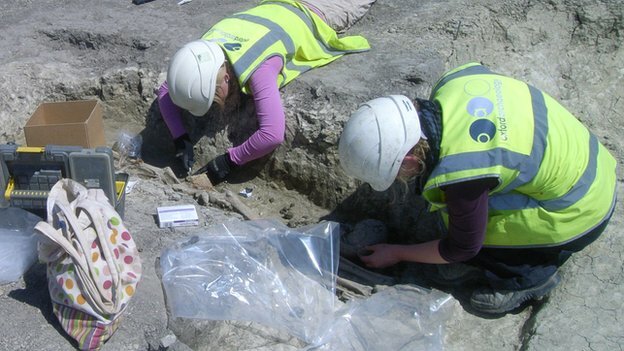 Archaeologist Kate Woodley, from Oxford Archaeology, said the team still had a lot of work to do analysing the finds from the dig, which could take another two years. "We don't want to say too much too early and get it wrong. "We'll get a more precise picture with carbon 14 dating and sampling." Karen Waggott, who is campaigning to preserve the site, feels the findings at Didcot were not revealed until "it's too late to save the site" from being built on. "We're only just finding out about this, and you blink and more houses have gone up," she said. "We're losing our history just as we're finding out about it." But Mr Masefield said although the site was the largest and "most significant" dig in recent years in Oxfordshire, there was nothing of "schedulable value" - so important that it could be legally protected. He said it was so significant because it "allows the interpretation of a large area of landscape through the ages". The project was funded by developer Taylor Wimpey, and had it not been for the firm's support, it would not have happened, he explained. To save some of the archaeology, Mrs Waggott suggested a "history trail" through the new estate, information boards to mark discovery spots and a museum. "They should leave a piece of land where the [Iron Age] village was. "Maybe if they could build a little roundhouse - then our children can see what was here once." A spokesman for Taylor Wimpey said: "We are eager to safeguard this window to the past. "Much of the Roman farmstead for instance, will be preserved under sports pitches. "Our intention is for the development to provide homes for generations to come in Didcot, just as the site has done for thousands of years."